The moon Callisto is the outermost of Jupiter's four Galilean satellites and, with a diameter of almost 3,000 miles, is the third largest in the solar system, after one of Jupiter's other Galilean moons, Ganymede and Saturn's moon Titan. It lies about 1,170,000 miles out from its host planet, which it orbits in about 16.7 days. Callisto is slightly the odd one out of the four Galilean moons, in that the other three, Io, Europa and Ganymede, are in "orbital resonance" with each other. This simply means that, when Ganymede makes one orbit of Jupiter, Europa makes two and Io makes four. The result is that, every so often, the three moons are lined up, which produces strong tidal forces on them, resulting in internal heating. The moon Callisto, on the other hand, is not part of this and therefore experiences no such force or resultant heating. Callisto is one of the most heavily cratered objects in the solar system. 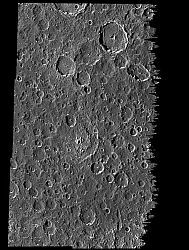 Indeed, almost its entire surface is pitted with craters. Despite this, the surface can still be divided into several different types. The cratered plain (example right) is what makes up most of Callisto's surface. Other areas can be light plains, bright and dark plains and multiringed structures. Callisto has no mountains or volcanoes to speak of. 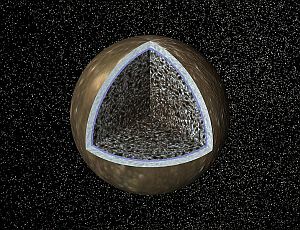 The cratered plain shown here is what makes up most of Callisto's surface. The multiringed structures are huge features originally caused by a giant impact. 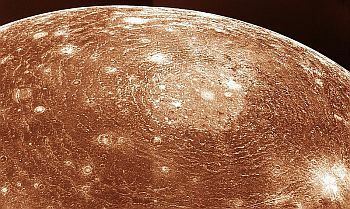 The largest on Callisto (and, indeed, in the whole solar system), with a diameter of around 2,370 miles, is Valhalla, found on the moon's northern hemisphere. The rings were probably formed because the impact broke through the hard surface layer of the moon, reaching the softer material (warm ice or possibly liquid water) beneath. This surface layer continued to break in concentric circles radiating out from the initial impact. 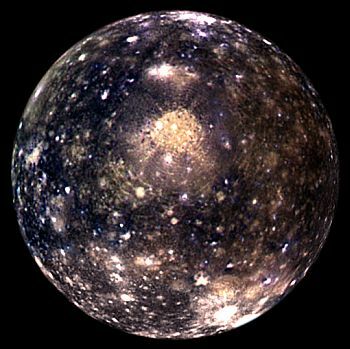 The composition of the surface of Callisto is similar to the rest of it - a mixture of water ice and rocky compounds. Most planets and moons have "differentiated" interiors. That is to say, they have clearly defined mantle and core. Callisto, on the other hand does not. Beneath the solid, icy crust, which is some 90 miles thick, there is simply a large volume consisting of a mixture of water ice and rock. The proportion of rock in the mixture becomes greater the nearer to the centre of the moon you get. It is thought that there may be an ocean of liquid water beneath the crust which could be as much as 125 miles thick, but this is only conjecture. Another unproven supposition is the presence of a tiny silicate core, which, if it existed, could have a radius of no more than 370 miles. The moon has been shown to possess a tenuous atmosphere. The Galilieo Near Infrared Mapping Spectrometer (no less) detected the presence of carbon dioxide. However, the Hubble Space Telescope has shown that there is oxygen trapped in the moon's surface, which may be released to enter the atmosphere. This layer of carbon dioxide and, perhaps, oxygen is so thin that it would be lost from the moon within days. Thus it is being constantly replenished by sublimation from the surface ice.